Located on Bellows Air Force Station (a military base), is only open on the weekends. But don't let that discourage you. Bellows is well worth the wait!! Gentle sloped beaches with soft sand make this an ideal family spot for the weekend, not to mention the wonderful scenic views and cool breezes. Kahana Bay is one of the most relaxing and tucked away beach locations, its beauty can set you back. Its inward crescent shaped bay is bordered by a soft gently sloping beach, a brook and a nicely shaded park. The shaded park is especially good for children and allows people to enjoy the beauty of the beach without having to be exposed to the sun. The water conditions are almost always calm, again great for children and novis swimmers. In the town of Kailua, past Waiamanalo and before Kane’ohe Bay, when comming from the Waikiki direction. Kialua is one of the worlds most famous beaches. The white sand beach has an extremely gentle slope to and way beyond the shoreline. In addition to the beach, the ocean conditions are mostly calm year round, making this beach ideal for families. It’s steady breezes and sandy shoreline, make Kailua Oahu’s windsurfing capital. Located right across from the Kualoa Ranch. This beach is very open and has calm water conditions, great for kids. 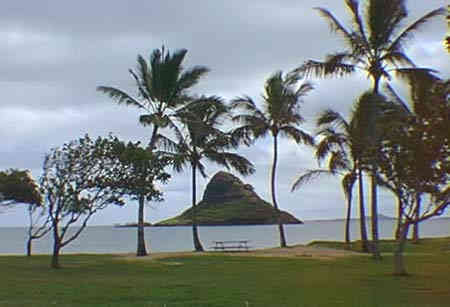 The beach also has a fantastic veiw of Mokoli’i Island, better known a Chinaman’s Hat. Makes for a great picture!! Located just South of Kailua Beach, this strip of narrow beach offers the most spectacular sunrise anywhere on the Island of Oahu. Be sure to get there early and bring a sweatshirt or light jacket, for the morning breezes can bring a chill at sunrise. This is a moment you will not forget!! The beach conditions during the day are very similar to those at Kailua Beach. Located across from the entrance of Sea Life Park. The Park has restrooms, picnic tables, and has a lifeguard daily year round. There is a 1,000 ft. of beautiful spacious white sand beach to fully enjoy. The rocky shores surrounding the area, are excellent spots for beachcombing, and for families to let there children play in the warm tidepools at the end of the park. Surfboards are not allowed, the beach is for swimmers and bodyboarders only!! Makapu’u is considered as Hawaii’s premiere bodysurfing locacion. During the winter the surf is very heavy and extremely hazardous. Only strong & experienced swimmers & bodyboarders should tempt the surf. During the summer the ocean conditions are much more calmer and are safer for the recreational swimmer. Don’t be fooled by the locals, they make it look easy, but remember, this is there home and they have a great deal of both, respect and experience with the ocean. Located about 1/2 mile from the Polynesian Cultutural Center in Laie. A great to take the kids, the beach is a mile long, with white sand and a gentle grade, the water is calm. There is plenty of parking, and if you go during the week, it’s a good chance, you’ll be the only one there. The Park has a very large heavily shaded picnic area, which is nice if the kids get too hot. Just off shore is a deserted island called Mokuaia, or better known as Goat Island. Goat Island is easily accessable by foot from the beach, at low tide. There’s a reef that goes from Cooke’s Point to the point of Goat Island, that you can travel when the tide is low. You can see the welcome sign of Goat Island from the beach, head toward the sign. Be sure to wear old shoes or some type of foot wear to protect your feet from the reef. The alternative and fun way is to paddle or float over of a raft, or an inflatable mat. 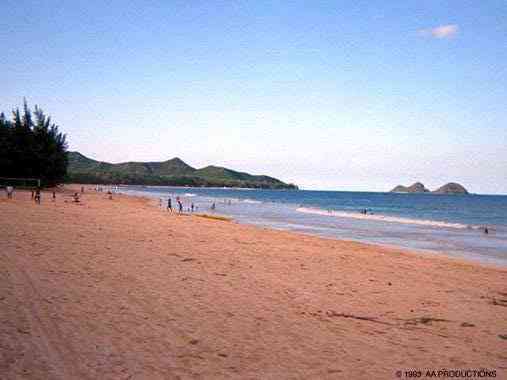 Waimanalo is another fantastic family beach location on the windward side. Again, gentle sloped beaches, & generally calm water conditions. The calm water conditions make Wamanalo an ideal location to learn to bodyboard and bodysurf. The park also has lots of open space and picnic areas and public restrooms. Makaha is one of several spactacular beaches on the laid back West side of Oahu. It’s best known for it ideal surf during the winter months, so be cautious during that season and check with the lifegaurds on surf conditions. During the summer months, the surf conditions are usually very calm, great for lounging around and snorkeling. Take time to enjoy the magnificant sunsets from Makaha or any of the Western beaches. Lifeguards, Picnic Areas, Restrooms, Showers. Nanakuli beach is one of the best scuba diving spots on Oahu. The beach park also has fun family activities such as a softballfield, children’s playground and a basketball/volleyball court. Lifeguards, Picnic Areas, Telephones, Restrooms, Showers. It is the only beach on the leeward side, where swimming is safe year round. But dont't always take it for granted, be sure to check the surf conditions, especially during the winter surf season. The bay is protected by breakwaters from high surf. The sunset views are breathtaking. Lifeguards, Picnic Areas, Telephones, Restrooms, Showers. It's the most western beach on the Island, but take the time to check it out. Beautiful views of the ocean and moutains. You pass it to get to Kaena Point, which is a site of its own worth seeing!! As with most Westward beaches, Ma'ili is known for it surfing during the winter surf season. The summer months and off surf season are the best time for swimmers. Those unfamiliar with the beach use caution, and check with the lifeguards for surf and ocean conditions & hazards. A boat jetty is nearby, so be aware of boat traffic. Lifeguards, Picnic Areas, Telephones, Restrooms, Showers. Definitly Oahu's most scenic lagoons. The snorkeling and swimming are fantastic. Take the time to stop by and have a look and get some sonderful pictures!! Located between Pupukea Beach Park and Sunset Beach. This is home of the Bonzai Pipline during the winter months and the surf season. Like most beaches on the North Shore, gentle sloping beach with calm waters in the spring & summer months, dangerous surf in the winter months, check with the lifeguards for water conditions before entering. Ehukai is fully equipped with restrooms and lifeguards daily year round. Ehukai is easily missed because of the foliage between the road and the beach park. Look for Ke Nui Road, that has direct access to the beach park. Not to worry, there are breaks and you can park along the road and enter the beach park through the breaks. If all else fails, be on the lookout for the elementary school on the right side, park there then cross the street. Home of great surf during the winter months, and calm surf during the rest of the year. Like most beaches on the North Shore, gentle sloping beach with calm waters in the spring & summer months, dangerous surf in the winter months, check with the lifeguards for water conditions before entering. 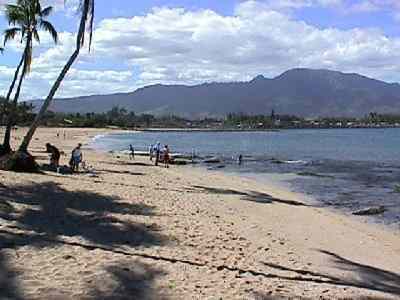 The beach has numerous ammenities, including jetski rental near Haleiwa Harbor. Take the time to sit on the beach and view wonderful sunsets!! Located past the town of Wailua, heading towards Kaiena Point. Mokuleia is across from Dillingham Airfield where gliders take off and land, and adjacent to the Polo fields. This stretch of beach is very quiet with a nice sandy beach with great views, making this beach perfect for picnic & pictures. This beach is out of the way for most people, locals & tourists, so its not unusual to have the entire beach to youself. While the beach is known for its surf, the beach is usually good for swimming & wading. Be cautious, the beach is not gaurded and some areas have a rocky bottom. Located a few miles past Ehukai Beach (Baonzai Pipeline). Sunset aptly named. The beach offers a spectacular view of Kaena Point, which is the extreme most tip of Oahu, and from the beach you’ll witness a phenomenal baeutful sunset right from the beach, take the time. The beach at Sunset is wide with a nice slope, and cusually calm waters in the summer, but in the winter months, the beach tends to have a deep slope due to the heavy surf conditions. Again be very cautious during the winter and surf season. Parking at Sunset is roadside, there are no restrooms, and lifegaurd duty is daily June through August, and year round on the weekends. Home of the famous Turtle Bay Hilton Resort. The bay is bordered by beautiful sandy beaches, that offer a wide variety of beach rentals. This is wonderful place to snokel, take a float on a raft, and just relax!!! Waimea’s beauty is absolutly breath taking. Comming from Haliewa, the Bay will be on the left side, and you will be able to over look the Bay as the road decends. Take the time to stop on the way out and take apicture. The view of the curved Bay with its clear blue water, and with the tower of Saints Peter & Paul Catholic Mission in the background, it’s love at first sight. While decending, the road will curve left, at the bottom of the curve on the left is the entrance to Waimea Bay. Just past the Waimea Bay entrance, on the right side, is the entrance to the Waimea Falls & Adventure Park. There’s ample parking , but weekends and during the surf season the lot fills quickly, so be sure to get there early. Not to worry if the lot’s full, there’s road side parking, then a short walk to the beach. During the summer the beach has a gentle slope, and the water is calm. On the left side of the beach is Jumping Rock. Jumping Rock is easily climbed, and when the conditions are good, people jump from the top into a well timed wave. The Bay Park provides daily lifegaurds year round, restrooms, outdoor shower and a large open lawn area with picnic tables. As with all beaches on the North Shore, beware of the surf during the winter months, and always check with the lifeguards for water conditions. Remember, Waimea is where the Best of The Best come to surf the big waves, and it’s common for swells of greater than 20ft. Located at the base of Diamond Head, at the eastern most tip of Waikiki, this strip of sand is known for it's windsurfing. The beach has a gental slope, making it nice for sun bathing and it's also good for swimming, body surfing & boogie boarding. But as with all beaches, check the surf conditions before entering the water. Located between Diamond Head & Koko Head Crater, just past the areas of Aina Haina and Hawaii Kai. As the road elevates up Koko Head, the Bay will be on your right as the road begins to crest. Parking is limited, so try to get there early. Be patient, a lot of people only stop to take a look & some pictures, then they leave, so keep your eyes open. This is one of Oahu’s natural wonders that must be seen and experienced !!! 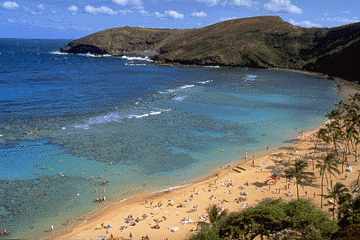 Hanauma Bay is an excellent place for beginner up to advanced snorkelers. Shallow and calm waters protected by a reef allows for spectacular underwater experience. This location is perfect for children since the Bay conditions are mostly calm year round. Fish food is availible for sale at the beach to feed the fish. DO NOT BRING YOUR OWN FISH FOOD !!! On both sides of the Bay is a raised rock ledge that is popular with beach goers and hikers. This is a beautilful hike, but be extremely carefull, and wear good soled shoes, and remember that waves have washed people off into the sea!!! Sandy Beach is popular body-board and surf location. Beware of surf conditions during the winter surf season, only very experienced and strong swimmers should enter the water. A constant breeze also make Sandy a very relaxing location to bring the family and have a picnic, and it's also a nice place to do some great kite flying. The beach itself is great for beachcombing. Sandy Beach has lifeguards, phones, showers, restrooms and picnic areas. Waikiki Beach is probly the most famous and most visited beach on Oahu, with millions of visitors each years. The view of Diamond Head is spectacular, and the water is crystal clear and calm most of the year. There are numerous activities to enjoy, surfing, snorkeling, boogie-boarding, canoes, paddle boats, beach volleyball and much more are all here for you. Advertise your Hawaiian site with us!!! Promote you Web site with us, and get the Web exposure you deserve! !